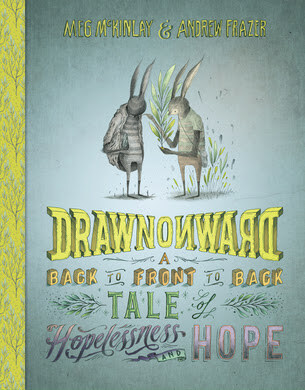 Drawn Onward is a fascinating and beautiful picture book for older readers about hope and hopelessness and how one can turn into the other. It starts with a sad looking long-eared creature with no face. He’s shadowy and gloomy and he holds a small bundle in his hands. As you turn the pages, the bundle grows and the accompanying text explores doom and despair, making statements about the world being dark and dismal. I imagine lots of kids feel this way sometimes — that nothing around them is good and they are powerless to change it. Many have likely felt the weight of a growing invisible bundle on their shoulders, growing bigger and bigger and weighing them down with sorrow. In the middle of the book, the giant bundle cracks, and as the story continues, yellow dirt spills out and plants start to grow. The creature gets colour and a face, and the accompanying text explores hope through statements about making a difference and changing things. And the very cool thing about this book is that all the words and sentences used to discuss hopelessness and despair are the very same words and sentences acclaimed author Meg McKinlay uses to discuss hope and courage. The whole book is a giant palindrome, which is a beautiful thing in itself, but it also conveys in the coolest way that hope can be found in hopelessness and sad feelings can change into happy feelings with a different perspective. There are also fantastic teaching notes available on the Fremantle Press website to guide discussion about creative writing, visual literacy and mental health. Accompanied by Andrew Frazer’s brilliant illustrations, Drawn Onward is a fresh and interesting picture book that I believe kids will really appreciate. It’s tough being young these days, and sometimes we just need some help to see that everything is going to be okay.